If you own an iOS device, you will be familiar with something like the standard iPhone email signature ‘Sent from my iPhone’. This is fine if you are just emailing friends, but it does not look very professional in business communications. On the iPhone, tap Settings > Mail, Contacts, Calendars > Signature. Type in your new email signature line. Easy, wasn’t it? However, what would look really good is an iPhone email signature that incorporates text, imagery and dynamic HTML content. To do this takes more effort but it can be done with a little patience. Note: This will also work if you want to create an iPad email signature. 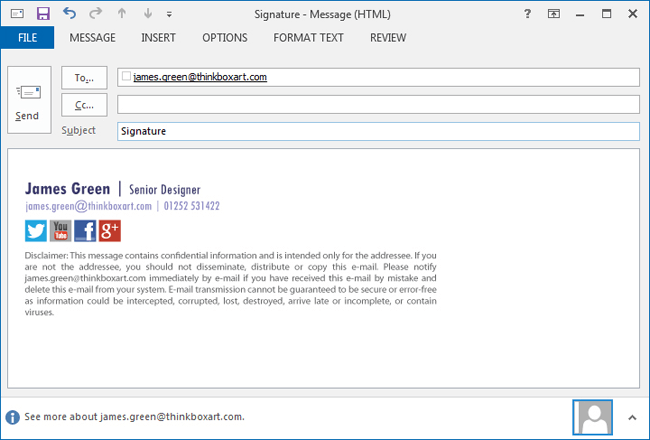 Create your email signature in an email client that supports HTML e.g. Outlook or Gmail. Make sure you add content such as your logo, social media icons and legal disclaimer. 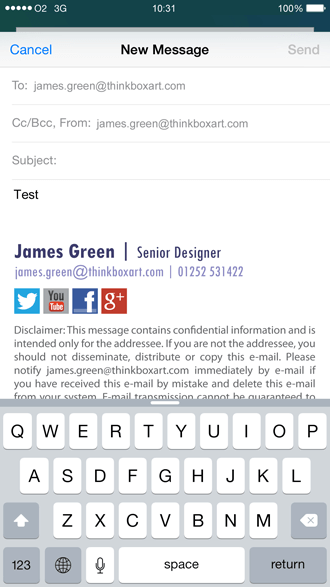 Send a blank email with the new HTML signature to your iPhone. Open the email you sent to your iPhone. 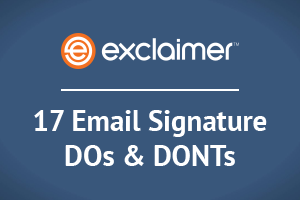 Find a part of the signature text that is not a web or email link. Press and hold this text. The context menu will appear over the text. Tap Select All, then Copy. 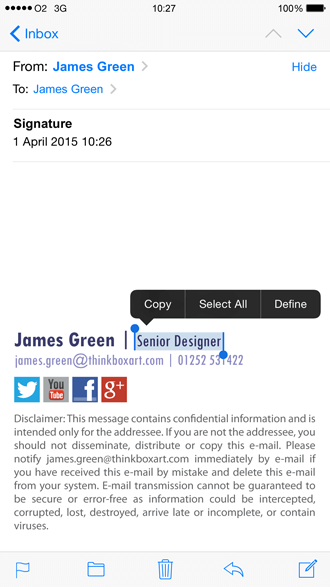 Go into the iPhone email signature editor by going to Settings > Mail, Contacts, Calendars > Signature. Delete any plain text email signature you might already have, press and hold the screen until the context menu appears and select Paste. 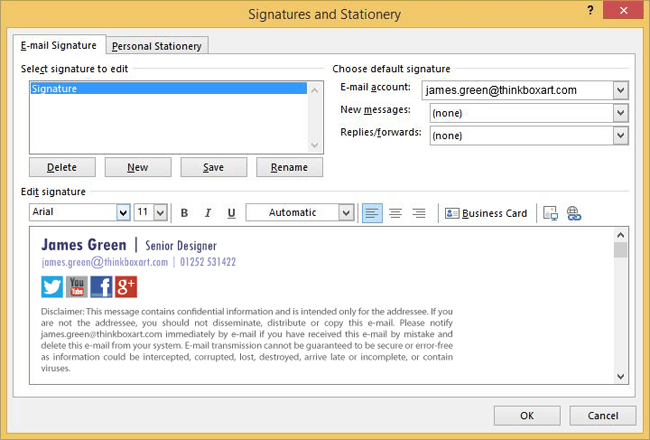 The new email signature will now appear in the editor. The original formatting will have been lost and it will appear slightly altered – this is normal so don’t panic! 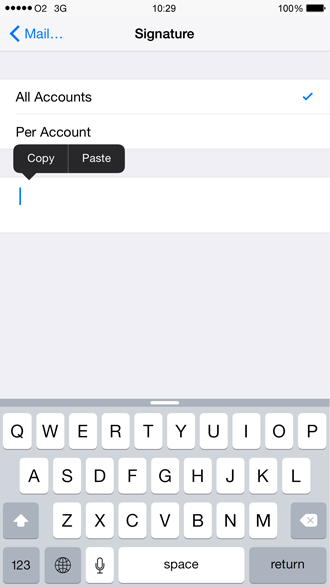 iOS automatically adds its own coding to the HTML source of the email signature. 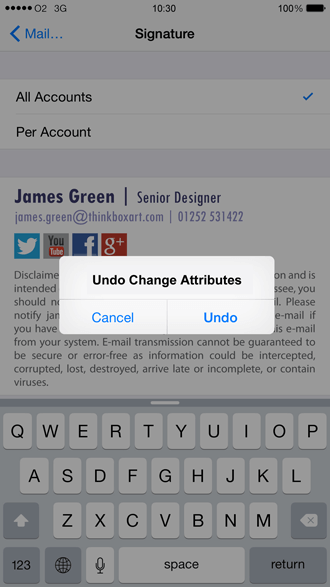 All you have to do is shake your iPhone to trigger the Undo Change Attributes context menu and select Undo. You’ve now successfully removed the additional iOS formatting. 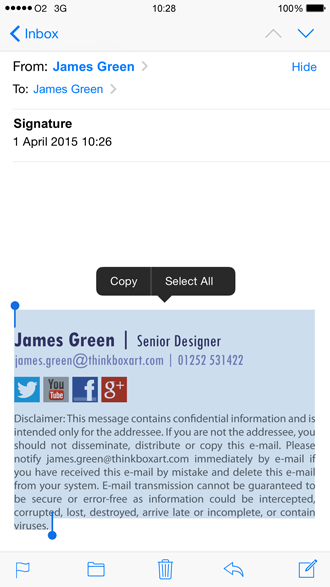 Go into the iPhone Mail app to see your new HTML email signature in all its glory. You’ll want to test it thoroughly before sending out any emails to other recipients. This process only works for one mobile device at a time. You will find it much more difficult to get all your users to create and maintain a consistent organizational iPhone email signature. Also, your iPhone users could be using email signatures that do not comply with your brand guidelines, which could also lead to missed marketing and business opportunities. With Signature Manager Exchange Edition and Exclaimer Cloud - Signatures for Office 365 all iPhones that send email via Exchange and Office 365 will have full HTML email signatures every time, maintaining your professional image and brand consistency. With the increase of mobile usage across all businesses, it makes sense to use dedicated email signature software and solutions to take the pain away.